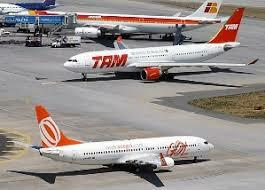 Are Brazilian airports ready to meet air passenger demand in next World Cup? Airports in Brazil have been a bottle neck for some time. In 2007, the country saw its first “apagao aereo”, an air blackout of gigantic proportions. With the Olympic games in 2012 and the World Cup in 2014, airports become even more important for the economy. But the sector is controlled by the state and private investors are constrained by a shy privatization program. Should we expect a happy ending? Here are some food for thought on this matter. Infrastructure went from almost 4% of GDP in the 70s to approximately 1% of GDP recently. In a sense, the deficiencies we talk mundanely about on an everyday basis are found in insufficient investment in this item (highways, airports, ports, bridges, hospitals, etc.). In 2008, the federal government initiated a program to privatize Brazilian airports. The model óf airports concession to private companies was supposed to be ready in 2009. Among the first in the list to be privatized was the Viracopos airport, in Campinas, in the state of São Paulo. It would help unload the heavy air traffic of the other state airports; Congonhas and Guarulhos. Also on the list was Galeão in Rio de Janeiro, preparing for the World Cup in 2014. Early this year, Nelson Jobim, Minister of Defense announced that the program would be postponed for next year, after the presidential elections. With delay in the schedule of works for the 2014 World Cup, the government decided to authorize the hiring Infraero engineering services in an emergency without having to comply with the 8666 law requiring bidding. Altogether, the 12 World Cup host cities, will be spending almost $ 5 billion in reforms of terminals. The bulk will go to Guarulhos, in São Paulo. The Centre for Asia Pacific Aviation comments on Brazilian airport infrastructure. “Brazil is struggling to find the USD 19 billion investment identified in a recent report by management consultants McKinsey that is required to meet the country’s passenger traffic demand up to 2030 and in anticipation of the 2014 World Cup and 2016 Olympic Games. Planning is not Lula’s strong suit. When it comes reforms that will impact the Brazilian economy in the coming years,the PT administration often prefers to make the easiest decision. This lack of long-term perspective is possibly one of the most important constrains to Brazilian growth. Specially in the sectors under public influence, such as airports. This entry was posted in Brazil, Business, Investment and tagged airport, Brazil, Centre Asia Pacific Aviation, Infrastructure, Lula, Nelson Jobim, Olympic games, World Cup. Bookmark the permalink.